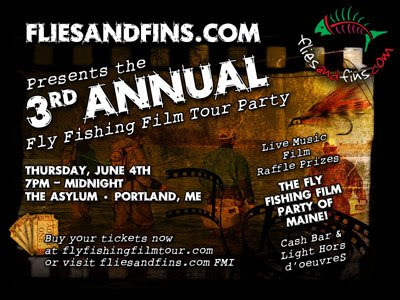 On Thursday, June 4th, the Fly Fishing Film Tour comes to The Asylum in Portland, Maine! Check out this thread on Flies and Fins for detailed information on this event. It will be an epic night of fishing film, friends, high-fives and, of course, frosty adult beverages. I have attended the FFFT last year and saw a viewing of this year's show in Mass a little while ago and I must say, it is a helluva show. You won't be disappointed. There are tons of goodies to be raffled off and lots of great anglers to meet. Go here to get your $15 tickets to the show. Thanks for the blog post on this event and for you guys and all of your following to make it to the show!! Definately wouldn't be the same without ya! Should be just a great night for fly fisherman to gather, see some of the worlds best fly fishing films have a few beers or soda or whatever, get a chance to win some cool gear, etc.. Look forward to seein' you all there! hi jeremy! flies and fins was certianly a caralyst for me when it came to a sudden leap into the world of fly fishing...thanks a whole bunch. I might have an open evening in my busy schedule to make this happen :) Looking forwad to seeing all of you fools at the event!